On Thursday evening, some friends of mine were asking about Chemo Gifts and how this whole thing works. They wondered how they could be more involved. I told them of having distributed most of the bags of encouraging quotes and the cotton gloves to the chemo treatment centers where my wife had been. When it came to how they could help, I mentioned that life has a way of producing opportunities. 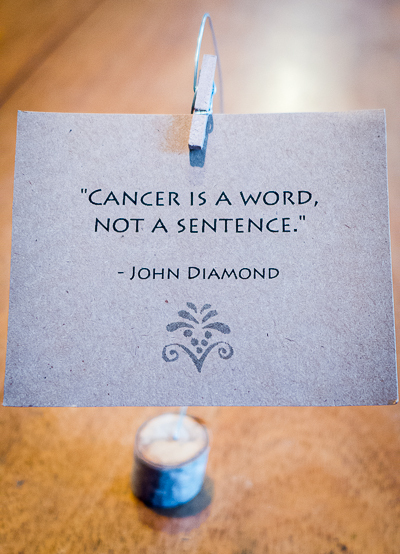 I’ve had some friends over the last month who have friends of theirs or family members with cancer. And so I reach out and provide them with these Chemo Gifts as well. I said I’d continue to do that as needs arise but we all agreed we’d be on the lookout for other ways we could each use our own interests and talents to help those around us. The wonder of this is not just the timing, but how Carole is doing exactly what we were discussing: using her creative abilities to do something meaningful and useful for someone else. Losing hair due to chemo seems, if you haven’t been through it, like a minor issue. After all, you’re battling for your life. Why worry about superficials like your hair? Except it isn’t just superficial. Your hair is part of you. Part of your identity. And to have it gone almost overnight can be devastating. Plus it signals to the world that you have cancer: It’s the first visual cue to others of your disease. And for both adults and little kids losing your hair can be scary, like an amputation, a part of yourself now detached. We can explain the scientific reasons for losing your hair to chemo, but more comforting — more helpful — is the power of story. That’s what Carole has done. And as a result of her using a passion for writing for a little girl in need, she not only is touching the lives of Eva and her mother, but all the others who are now involved in this project. chemo, creativity, giving, writing. Bookmark.